The following information summarizes CSA Ocean Sciences Inc. (CSA) involvement in this project using text and photos found in the public domain due to our sensitivity to releasing any proprietary information and the Navy’s need for confidentiality. In February 2009, the 567-foot long guided missile cruiser U.S.S. PORT ROYAL ran aground atop a coral reef fronting the Honolulu International Airport’s Reef Runway in depths of approximately 14 to 22 feet. The area where the U.S.S. PORT ROYAL ran aground is described as a complex spur and groove fringing reef (outcrops of coral interspersed with sandy areas). 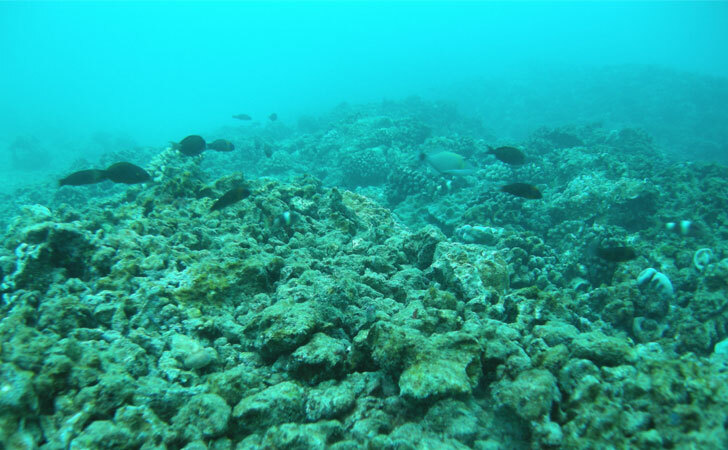 Numerous printed resources and the evaluation by various coral reef biologists concur that this area was one of the finest remaining spur and groove reef habitats on the island of O‘ahu. Photo of a diver inspecting the coral reef damaged by the USS Port Royal grounding. Photo by Hawa’ii DLNR. CSA Ocean Sciences Inc. (CSA) conducted an initial impacts site assessment for the Office of the Judge Advocate General, Admiralty and Maritime Law Division of the Navy (Navy) to map the impact areas and ascertain the extent of work required to repair the coral reef. The assessment identified and mapped 8,371 square yards of impact created by the grounding. Acting on a request from the state of Hawa’ii to repair the damage to the coral habitat, the Navy spent $7 million dollars restoring the reef. The Navy contracted CSA scientific divers to collect and reattach over 5,400 loose stony coral colonies using hydraulic cement, with commercial diver and vessel support from Sea Engineering, Inc. (SEI). CSA and SEI performed these efforts under a subcontract to AECOM through a Master Service Agreement with the Navy. In June 2009, the Navy and Hawa’ii Department of Land and Natural Resources (DLNR) suspended coral reattachment operations due to high summer surf conditions. In late summer (August and September 2009), the Navy stated that marine biologists checked the stability of the rubble and assessed the reattached coral and indications were that the initial efforts were successful.